With only a name, you can find a digitized version of the Veteran's Enlistment Record. This record provides their Army Service Number, as well as other key details for further in depth research. The next step for more detailed information is in St. Louis. The National Personnel Records Center is the repository for the Official Military Personnel Files. These files contain awards and discharge information amongst other data points. The 90th Division Association has a historian who frequently visits the National Personnel Records Center. This book lays out the components of the individual personnel files, death records and other associated records that can be obtained from the National Personnel Records Center. A listing of sources and further information on how to begin researching a veteran is provided. The information provided is a useful start to research. No endorsement is made of the Museum itself or its operators. The United States Army Heritage and Education Center, in Carlisle, Pennsylvania, is the U.S. Army's primary historical research facility. A number of 90th Division Soldier Surveys are on file at USAHEC. If you are a WW2 Veteran and have not completed a Soldier Survey, it is a worthwhile and easy way to reflect on and communicate your time in service. Raw combat footage from the US Army Signal Corps digitized and grouped into invaluable research tools for historians and collectors. Carefully researched and well captioned, this is the original source material that is often heavily edited and chopped on TV and Film. 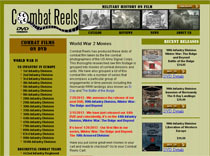 Combat Reels is part owned and operated by 90th Division Historian, Tyler Alberts. . The National Museum of the U.S. Army at Fort Belvior, Virginia strives to provide a place to capture the voice of the men and women who served our nation in the United States Army. A potentially useful tool in further in depth research of a veteran with a focus on Geneology and government docusments such as Census Records. Ancestry.com is a paid subscription service. It has been valueable for some of our members. There are often "free trial" weekends available.